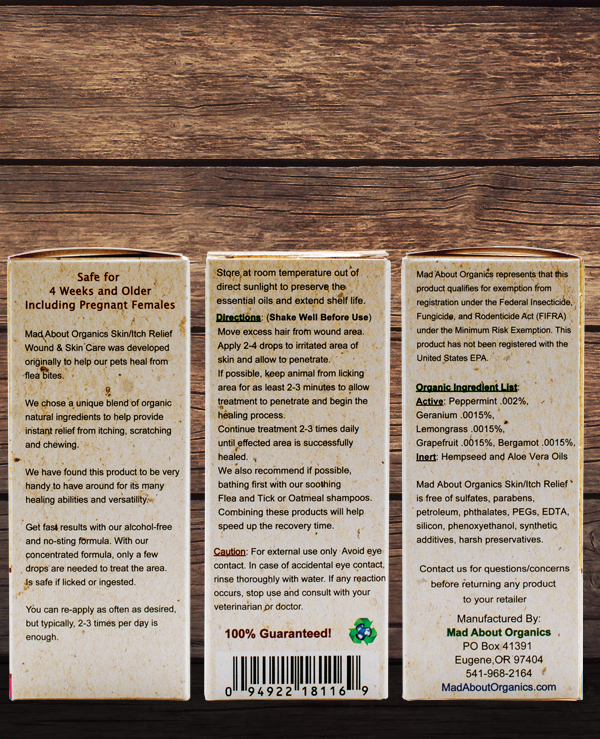 "Miracle in a bottle" is the best way to describe this product! It has been observed that itchy skin, paw chewing, constant licking and allergies in cats have become more common than ever before. Like us, animals get bitten, stung, have allergic reactions to insects or many other irritants, or even get sunburned. Excessive licking, chewing and scratching can lead to open sores, setting your pet up for a skin infection. 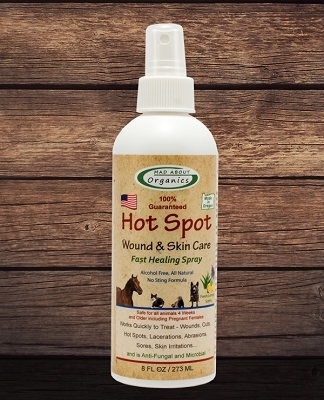 Our organic skin-itch relief formula aids in all of these situations including hot spots. Hot spots are a result of a skin condition officially called pyotraumatic dermatitis. It is a bacterial infection that develops and rapidly spreads in the skin. Hot spots will be warm to the touch, and painfully itchy for a pet. Hot spots emit pus and smell badly. Hair loss from around the infected area is common. Because cat hot spots are so painful and irritating many pets will bite and scratch the area causing the infection to spread. Hot spots are most common in animals with thick coats however, hot spots can occur in any breed. A common cause for hot spots is moisture getting caught next to the animal's skin, making an ideal spot for an infection to start. Moisture can become trapped by matted fur, a collar, or simply thick fur. Many times chronic animal hot spots stem from an allergic condition, though some cats are simply more prone to hot spots than others. 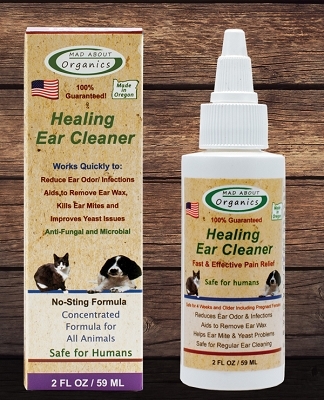 It is best to treat hot spots quickly to prevent further spreading of the infection, and for the relief of your pet. Also, some animals will scratch at a hot spot to the point of breaking the skin. This makes the condition even more painful, and provides the opportunity for a more serious infection to occur. Our Skin Relief Treatment soothes the area so the healing process can begin, and relieves all of the irritations on contact. With just a few drops on the irritated area, this concentrated blend of organic essential oils starts to work on contact. 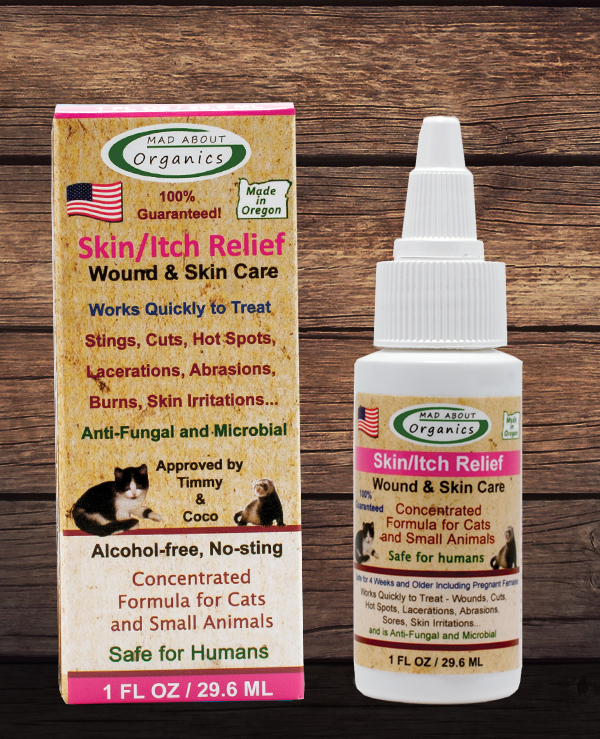 Mad About Organics' organic skin-itch relief healing treatment formulated for cats and small animals is made in the USA - based in Eugene, Oregon and packaged in a recyclable plastic bottle. Apply a few (2-5) drops on the affected area and gently massage in. The oils will start to work immediately and all of the irritation will start to go away, leaving your cat in complete happiness. It is truly that easy. And yes it is okay if your cat licks afterwards, but we usually recommend holding and petting them for a few minutes to allow the oils to penetrate and begin the healing process. 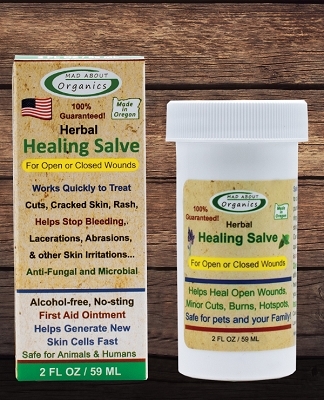 99% Blend of Organic (Aloe Vera from the inner fillet), Hemp Seed) and a 1% Blend of Beneficial Organic (Peppermint, Geranium, Lemongrass, Grapefruit, and Bergamot Essential Oils).